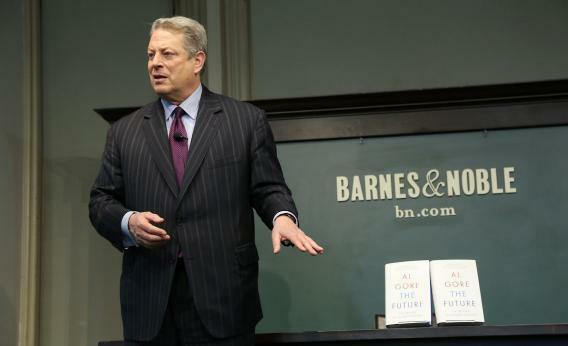 Al Gore promotes his new book, ‘The Future’ at Barnes & Noble Union Square on January 30, 2013 in New York City. Barnes & Noble has put out a genuinely impressive performance over the past several years. Here you have a retail chain, originating from a bookstore in New York City, that saw its industry being disrupted and rather nimbly decided it wanted to make a piece of computer hardware. And, amazingly, the Nook is a pretty good piece of computer hardware. If the iPad and the Galaxy Tab and the Microsoft Surface and the Kindle Fire didn’t exist, you’d say the Nook was a revolutionary device. The problem is that it’s not the best such device on the market. Or even the second best. Or even the third best. And while some industries have room for many global players (think cars—GM, Volkswagen, Toyota, Hyundai, Ford, Nissan, PSA, Honda, Renault, etc.) it looks like there’s only room for two or three platforms in this game. And B&N doesn’t have one. Today they announced that contrary to earlier reports, losses in the Nook division are going to grow this year rather than staying flat. And all sales across both the Web and brick-and-mortar stores fell nearly 11 percent. They’re doing an impressive job of staving off collapse in the face of massive disruption, but not good enough. It makes me sad, personally. Before Barnes & Noble was a national behemoth it was just my neighborhood bookstore, as I grew up blocks away from the original shop. I always liked to root for it against Borders. But it won’t be long for this world.